Kampanilya – Scientific name: Allamandra cathartica L.
Vigorous vine, smooth, slightly hairy. Leaves are opposite, in whorls, lanceolate or oblong-lanceolate, 8 ro 12 cms longs, 2.5 to 4 cm wide, pointed on both ends. 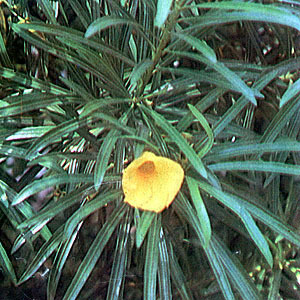 The flowers are yellow and short-stalked. Calyx teeth are lanceolate green. Cultivated as ornamental garden plant. Also found wild in thickets near settlements. Purgative, cathartic with hydrogogue effect. The whole plant is reported to be poisonous. Infusion of leaves for colic; also purgative and emetic. Decoction of leaves in small doses used as antidote for poisoning. Decocotion of bark in decoction, in small doses, has a cathartic and hydrogogue effect. In large doses, the bark and latex are poisonous. Extract of leaves used for colic and as laxative; in large doses causes diarrhea and vomiting. This entry was posted in List of Medicinal Plants in the Philippines and tagged kampanilya on March 19, 2009 by Pinoy Herbs. yellow bell seeds crude can be extracted as fuel.